‘God is in the details’ to quote Mies, and some of the details and craft of Levitated Mass are the devil. If art can be defined by the highest level of craft, then more should be expected from Michael Heizer’s team – especially the engineers and the welders. Almost seems that the trench was designed before they found the rock, and the brackets were the ‘make-it-work’ solution with some of the sloppiest welds this side of a vocational school. So here is a rundown of the good, the bad, and the ugly of the Levitated Mass installation at LACMA. The concrete work is highly refined at the level of a James Turrell Skyspace (but not equal to Tado Ando or other concrete masters), with a very smooth skimcoat on all exposed surfaces. I’m puzzled by the triangular notches at the ends of the trench (see above), as they are gratuitous interruptions to the visual pull of the rock. 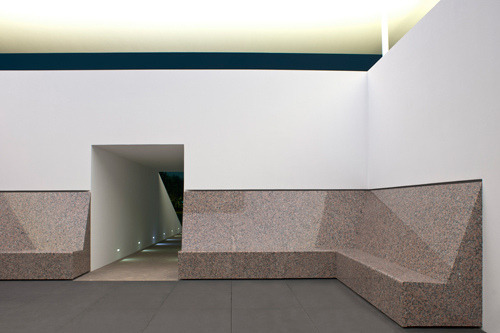 The integral ADA mandated handrails are quite elegant, and again invoke Turrell. The grading around the trench is quite precise, but seems designed for easy maneuvering of the bulldozer, not for visual or tactile effect. From the Cor-Ten rail edging, there is a gentle slope to the walls of the trench. This puts the Rock at waist height when standing next to it. First impression is that the soil of the slope towards the trench has been treated with a polymer stabilizer as it has a slight sheen and is darker (see below) then the adjacent decomposed granite surface. While suppressing dust and minimizing erosion are worthwhile goals, the desert that the decomposed granite is intended to evoke is a dusty and eroding place, so soil stabilization works against the larger intent. That edging strip could be the crown of a railroad extrusion, if weathering steel was used for train tracks. The official dedication ceremony for Michael Heizer’s Levitated Mass is set for 11am on Sunday, June 24th at LACMA. Christopher Knight of the LATimes has an early review of the work with photos by Mel Melcon (all the images used in this post). Knight’s piece is a solid review that pulls in a myriad of non-obvious precedents, potential influences and narratives that haven’t been part of the discourse to-date. “Levitated Mass” is a piece of isolated desert mystery cut into a dense urban setting that’s home to nearly 10 million people. A water-hungry lawn north of LACMA’s Resnick Pavilion was torn up and replaced by a dry, sun-blasted expanse of decomposed granite. A notched gray channel of polished concrete slices 456 feet across the empty field, set at a slight angle between the pavilion and 6th Street. Like a walk-in version of an alien landscape painting by Surrealist Yves Tanguy, quiet dynamism inflects a decidedly sepulchral scene. What really, really surprises me about the installation are the hefty steel brackets that the monolith is mounted to. All preliminary descriptions evoked a rock sitting directly on the concrete walls of the trench, not mounted on massive steel corbels. The maximalist brackets are a significant shift towards structuralism and away from from Heizer’s minimalist material palette of soil, stone, and concrete (artificial stone). If hidden mountings and connections had been utilized for the rock (I’m thinking about Brian Murphy’s Hopper House) or other highly refined mininalist architecture, then we could have experienced the illusion that the boulder was hovering. As detailed, those gusset plates express the shear mass being supported and bring the levitating mass crashing back to earth. Lots of architects have used similarly proportioned gussets with Cor-Ten structural elements – this is no Gehry, Eric Owen Moss, or Thom Mayne building though – perhaps Michael Rotondi is part of their lineage. (Here are some images of similar details: 1, 2). The artists that pop to mind from these brackets include Mark di Survero with his structural steel sculptures and Serra for his pioneering use of weathering steel. The Chronicle for Higher Education looks at Ecological Urbanism from a weird perspective, and written by Jon Christensen, who recently appeared at the Now Urbanism project at the University of Washington (which gets mentioned at the end of the article). [W]e ought to be teaching a new generation of students how to balance multiple objectives to increase sustainability from the city core out to the wilderness, along what Andrés Duany calls “the transect.” All along this transect, trade-offs must be made between people and nature. But in our own canvas of urban-planning programs at American universities, we found relatively few programs that offer an explicit and sustained focus on ecology and conservation science. And few programs in ecology and conservation offer any in-depth exposure to urban planning. Integrated programs that teach students both urban and conservation-planning principles will be key to overcoming this deficiency. Moreover, other disciplines should be brought into this vital conversation. The 2007 I-35W Mississippi Bridge Collapse in Minneapolis has become just one of many infrastructure failures from the past few years. But here in the Twin-Cities, crossing the River is part of our daily life. The impact of the collapse and rebuilding is still resonating within our collective memory and in the fabric of our metropolis. 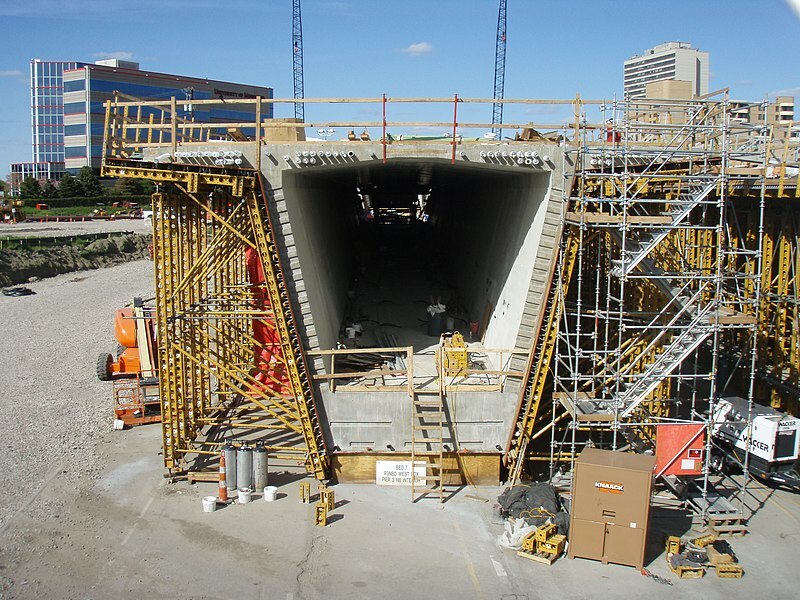 Following the collapse, there was a symposium at the University of Minnesota in October 2008 to explore the fallout and implications of the bridge collapse hosted by the River Life project. My colleague and friend, Patrick Nunnally, edited the essays that emerged from the symposium into a book published in spring 2011. I promised him a no-holds bared review, so here it is. The essays vary in relevance to potential readers and perhaps limit the overall significance of the book by limiting their connections to the larger context. The one essay that transcends this provincialism is Tom Fisher’s chapter ‘Fracture-Critical: The I-35W Bridge Collapse as Metaphor and Omen’ (an excerpt/derivation of this essay can be read on Places). Tom connects the failure of the gusset plates to the failure of our financial system, the failure of the levees in NOLA in Katrina, and our culture that cares more about paying the lowest up-front price for anything. He wraps up his chapter by discussing the need to build a more resilient future (which of course gets me all excited). Over the coming decades, we need to bring together all of the environmental knowledge we have in order to nurture the natural systems we depend on, with all of the ethical understandings we can muster to help us thrive within the material constraints we will face. Of the bridges we will need to build in the process, the bridge in understanding that will help us leave behind our old hubris in order to reach a newfound humility may be the most important of all. Avoiding fracture critical systems is a significant challenge for the 21st century. Conversely, avoiding unintended failures caused by the increasing complexity of systems is also a rising threat. There is a good failure analysis of the bridge on Free Republic, and the official MnDOT 35w bridge pages on the history of the bridge, about the collapse. Thanks to Patrick Nunnally and the University of Minnesota Press for provided the review copy. 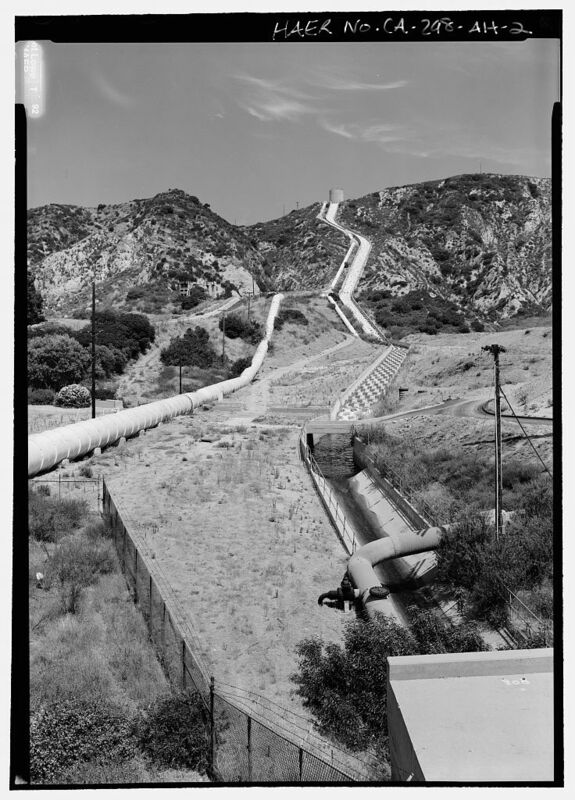 Excited to share news of receiving the word that I’ll be getting a $100,000 grant (thanks to the assistance of Dean Woo) to organize activities to commemorate the November 2013 Centennial of the opening of the Los Angeles Aqueduct at Cal Poly Pomona. Once the gift is finalized, I reveal the sponsor and details of the project. In the meantime, I’m busy organizing the courses and exhibition that are the core of Aqueduct Futures. Stay tuned!!!! I’ve also heard that CLUI, Occidental College, and Arid Lands Institute are all possibly planning efforts to commemorate the Centennial. Please let me know if there are other efforts in the works! This post has been sitting on the back burner for two years since I came across the post’s title over on the EPA’s Sustainable Infrastructure for Water and Wastewater. The EPA uses the term to describe the lack of funding, not physical or technological short-comings. ‘Infrastructure gap’ evokes a deeper range of issues and challenges that our society (and planet) face that aligns with my own interests. Hillary Brown’s essay on Infrastructural Ecologies over at Design Intelligence (also discussed on Mammoth), brings up some interesting parallels – though it is also about the lack of infrastructure investment and less about the interaction of infrastructural systems (aka an ‘ecosystem’) or about infrastructure that provides ecosystem services. First principle: Systems should be multipurpose, interconnected and synergistic. 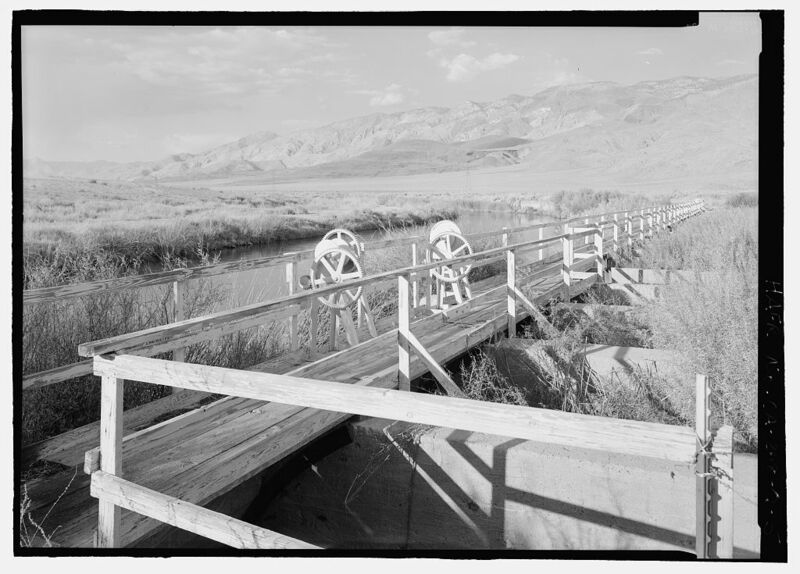 Second principle: Infrastructure should work with natural processes. Third principle: Infrastructure should improve social contexts and serve local constituencies. Fourth principle: Infrastructure should be designed for resilience, to adapt to foreseeable changes brought about by an unstable global climate. Architects seem to be appropriating the term ecosystem to describe typologies and hard relationships, like in Lisa Tilder’s & Beth Blostein’s Design Ecologies: Essays on the Nature of Design. Which isn’t about ecology (or nature) at all, but typologies of design processes. Perhaps this mis-use can be blamed on Jeff Kipnis (the overlord of architecture at OSU where Lisa and Beth both teach.) Full disclosure, Beth was a classmate of mine.